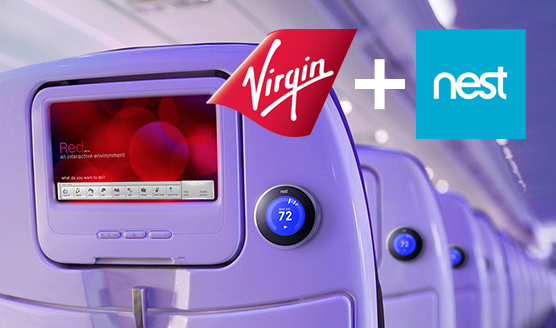 Googles latest purchase ‘Nest’ will be on every Virgin plane! Nest have experienced a quick rise from tech start-up in 2010 to tech giant today in 2014. According to Gigaom.com in January 2013 Nest where shipping 40,000 to 50,000 units per month. I am inclined to believe that this number will be substantially higher a year on along with the Google acquisition buzz. Posted on Nest’s blog on their website a couple days ago (31st March 2014). Head of Marketing Doug Sweeny talks about how for almost a year they have been working alongside Virgin America to tailor NEST to help provide virgin customers with ‘one of a kind travel experience.’ Having spent many hours flying in my life I believe this would be a fantastic gadget to have the power to control whilst at 35,000 feet. Each traveller will have a NEST to control their own personal space. Personally as I don’t fly Virgin much it doesn’t look like I’m going to be able to enjoy this luxury but if this turns out to be a success for Virgin (which it has a great chance to) why wouldn’t all major airlines get involved! Take a little look at the impressive promo video of Richard Branson (Founder of the virgin group) and Tony Faddell (CEO and founder of NEST) having a chat about the partnership!